Once she got over the initial shock and panic, it hit her like a lightening bolt. This situation was a gift from the Universe. She was very successful, as was evidenced by the successes of clients who were thriving and the very positive annual performance reviews. Realizing how she despised working for someone else, having to follow systems that made no sense to her creative, inventive mind and being treated in a less than respectful manner, she began to realize that this was one of those, “when one door closes, another door opens” situations. Julia had made up her mind that she was not ever going to work for someone else again. Scouring the internet to find business ideas, she came across an offer of a scholarship for a $1500 program at Dream University. She filled in the application and hit the submit button. A day later, she received an email telling her she had been granted the scholarship. When one of Julia’s clients went home early from his job that he quit because he didn’t like the way the manager spoke to him, she realized she had to do something about it. She started working with people to create small entrepreneurial opportunities. After Dream University, she found a self-study program called Monetize Your Passion by Rich German. She purchased the program and studied it every day to learn how to build an online business and when Rich offered a year long coaching program, Epic Coach Academy, she signed on right away. With his permission, Julia adapted the program for teenagers and created Monetize Your Passion Blueprint. She now teaches this program through Monetize Your Passion Academy to teach teenagers, twenty-somethings and families the values, habits and skills of entrepreneurship so that they can start their own business. Julia’s vision for the future is that all young people have come to believe in themselves, have started their own businesses and have become job creators that has had a positive impact on the economy of their area. 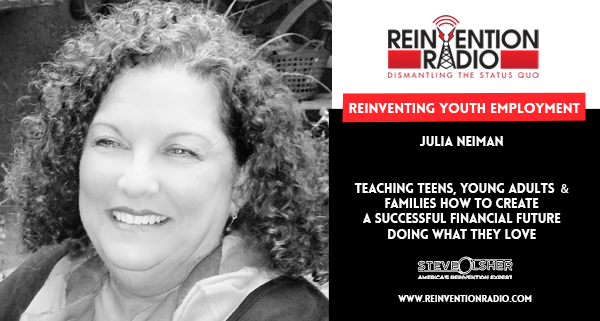 TUNE IN to hear Julia discuss with Steve, Mary and Richard how she teaches teens, young adults and families how to create a successful financial future doing what they love. Why the foster care system? Reinventing Social Connection – In this episode, Anthony Franck discusses with Steve, Mary and Richard how to connect with more people socially online & become an industry authority. This was an incredibly interesting discussion. The thought provoking insights shared by Julia are extremely valuable. The issues discussed and the solutions provided need to be shared broadly. Thank you for your part in creating awareness toward making a needed difference! Thank you for taking the time to listen and to comment. We couldn’t agree more with regard to Julia’s insights. She is doing fabulous work! So refreshing to enjoy an optimistic discussion on what we CAN be doing to empower youth and young adults with entrepreneurial skills and mindsets as opposed to all that is going “wrong.” Thank you Reinvention Radio and Julia Neiman for a great show! Hey Marlaine! Thanks for listening and for taking the time to comment. Empowering our youth is extremely important in today’s world. Take care.